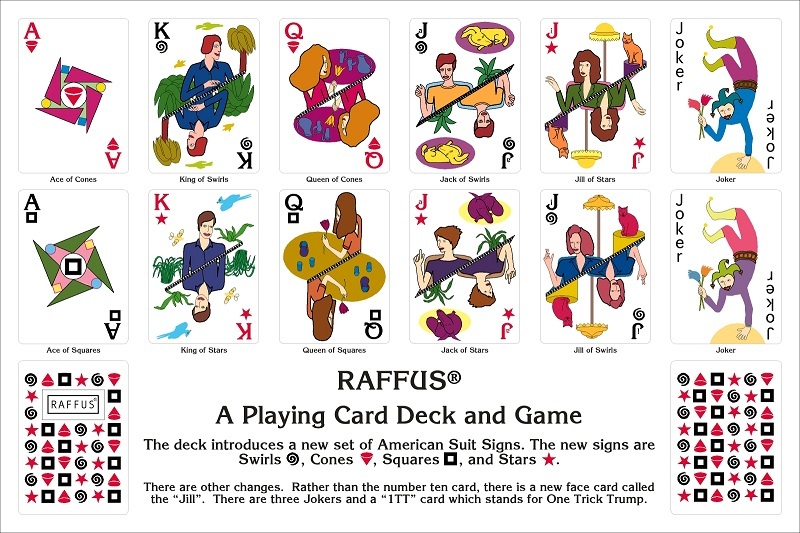 RAFFUS ® is an exciting new card game for the twenty-first century. Its evolution began during the summer of 1978, as two artists were playing a very simple card game called “Rat Love.” (Not the actual name of the game, but as it seems to have originated in the Navy, I can’t print that name in polite company.) Many of the original basic rules have been retained and incorporated into RAFFUS ®. Over the years, the rules continued to evolve, culminating in the game we have today. I was excited about creating the playing card deck because I’d always wanted to design one and this new game warranted it. Historians are unsure exactly when playing cards first existed or where playing cards came from. Some believe the earliest playing cards evolved from the fortune-telling tarot cards of the early fifteenth century. Those first cards came from Italy, Spain, Germany, and France. Some had varying suit signs, but in general, most had four suits with three face cards: King, Queen, and Jack. The suit signs on today’s U.S. playing cards have the French suit signs of Hearts, Spades, Diamonds, and Clubs. A major change to the seventeenth century playing card occurred in the early nineteenth century, with the introduction of the double-headed face cards. The faces on these cards are always right side up due to the use of a horizontal or diagonal line, with repeated images, top and bottom. One goal in developing RAFFUS ® was specifically to be able to design a playing card deck especially for the game, but the primary goal was the design of the deck itself. I wanted to create a deck of cards that would be unique and recognized as the first playing card deck designed and created to be from the United States of America. For this, you needed an entirely new suit design. I changed the Spades to Swirls, Clubs to Squares, and Diamonds to Stars. (Being fond of the Hearts, I kept them the same until the game was updated for my computer app edition, in which I changed Hearts to Cones.) Although, I kept the King, Queen, and Jack, I replaced the ten card with the “Jill”. With the creation of Jill, Jack can finally have a complete relationship. The curator of the card museum in Cincinnati, Ohio, whom I spoke with in 1988, said that as far as she knew, the Jill was an original idea. 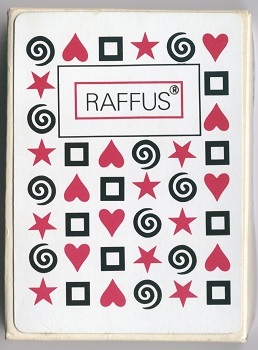 I produced 1,000 decks of RAFFUS ® playing cards in 1988. 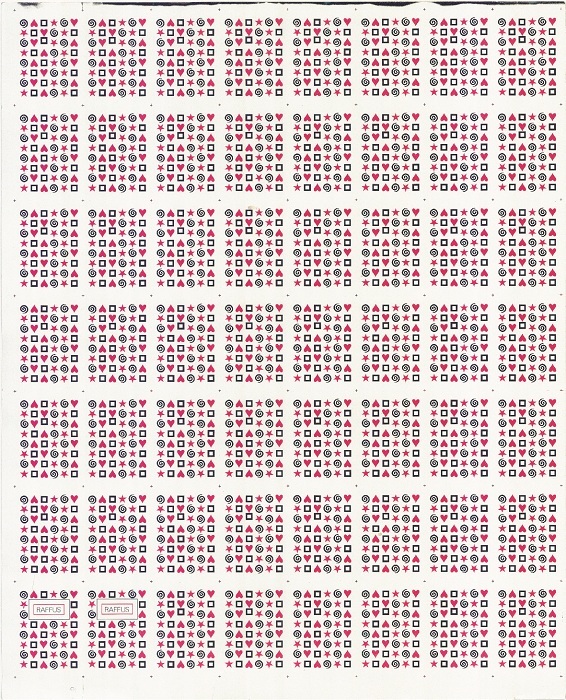 I also produced 125 full uncut sheets of the card deck on playing card stock paper. There are a few design flaws in this first edition, but they still exist and are for sale. The first edition was created by working with India ink, acrylic paint, and acetate overlay sheets to create the designs. I corrected all mistakes and design flaws in the second edition which I updated on the computer. 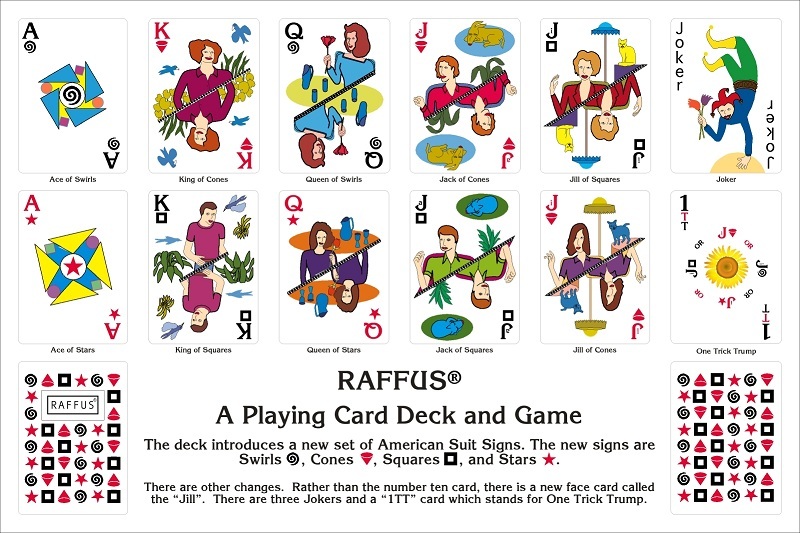 For example, when playing with the first edition of RAFFUS ® cards, I saw immediately how hard it was to tell the difference between the Jack and Jill, so in the next edition I added the small “a” inside the capital “J” for the Jack, and small “i” for the Jill. In addition to some minor rule changes, the up and coming computer app edition will have two new cards: a third joker, and a new card called the “1TT” card, a One Trick Trump Card. While the posters and full, uncut sheets of the card deck are available on the SurrealPrimitive site, the card game itself is available at www.raffus.surrealprimitive.com. I have made two RAFFUS ® posters of the second edition available for purchase, showing all design changes. The major differences are changing the suit sign of the Heart into the Cone suit sign, alteration of the Jack and the Jill, and creation of a third Joker and new 1TT card. These design changes are only reflected in the two posters that are available and not in any existing deck. 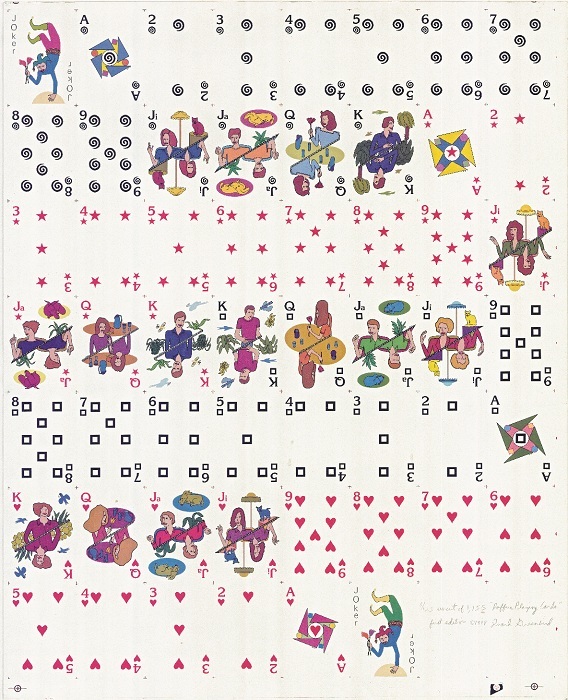 There is no second edition of the playing cards as of yet, nor is there a computer app. They will become available in the future.